DiyParadise Monica2 DAC with Rudolf Broertjes' SS I/V Stage. The lovely Monica gets some help! Product: Rudolf Broertjes SS I/V stage (kit for use with DiyParadise 'Monica2'). I reviewed the DiyParadise Monica2 NOS DAC way back in October 2005 and was suitably impressed. However, for me it didn't have quite a strong enough presentation for it to replace my modified Scott Nixon DacKit. It seems that I wasn't the only person to feel this way about Monica2, and at least a couple of people set about remedying the problem. One solution was a valve gain stage that apparently sounded quite good. But Yeo, of DiyParadise, had his attention drawn to a discrete solid-state output buffer designed by Rudolf Broertjes. As soon as he heard it, he wanted all his Monica2 customers to hear what it could do for Monica2. So, with the agreement of Rudolf Broertjes, he designed a PCB for the I/V stage, and now offers both this, and a kit of parts from his online store. Well I finally got my hands on this output stage, thanks to a friend in Australia who had built one and kindly sent it to me to try. I needed only to make some fairly simple modifications to the Monica2 PCB and provide a suitable power supply for the I/V stage. Yeo describes the mods to Monica2 here and anybody with some DIY experience should be able to see that the changes are quite simple. A good soldering iron, some de-soldering braid, some snippers and a small pair of tweezers are all that is needed to remove the parts from the Monica2 PCB. The picture on the right shows where the two resistors, two diodes, and two capacitors have been removed and replaced with simple wire links. I followed Yeo's suggestion and re-used the burned-in Black Gate capacitors on the output of the I/V stage. The I/V stage is connected to the Monica PCB with four short wires, and to the output phono sockets with another four short wires. There is one modification that I found necessary, and that is to add some resistors from the output to ground (47K-56K are fine) to bring the offset DC voltage down to zero. Finally, two wires are soldered between the power supply for the I/V stage and the PCB. I already had a decent 12 volt supply for the DAC so I decided to start of with that supplying the I/V stage as well. Having thoroughly checked everything, I turned on the power supply and then adjusted the voltage across the output caps in the I/V stage to 6 volts, ie half the supply voltage, as recommended. I checked the offset DC again to confirm that it was still zero and then connected Monica2 into my system. With so little work involved (and let's be honest, not much cost) I wasn't expecting too much. But as soon as the music flowed from the speakers, I could hear the improvement, and what an improvement! Cymbals positively sparkled and the bass had gained definition that definitely wasn't there before. Quite simply, the I/V stage brings out the potential of the Monica2 DAC that is only hinted at without it! There really isn't anything else to say other than this is a no-brainer mod to a Monica2, or any other TDA1545 based DAC. The 1543 based DACs have a 'stronger' output and may benefit with the I/V stage added but probably not so much. Not so hot with the DIY bit? Don't worry, because on a visit to the DiyParadise site, to check some facts for this review, I noticed that they are now offering a Monica3 DAC, that appears to be an updated/upgraded Monica2 with the I/V stage built onto the same PCB. In addition, Monica3 has updated circuitry that is designed to reduce jitter. Just to add some icing to the cake, they have added pairs of Black Gate capacitors on the output, with each pair in what is called the 'Super E configuration'. 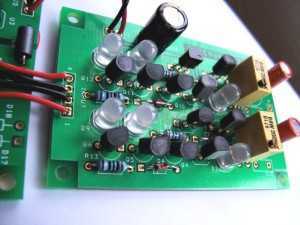 This involves placing two non-polarised capacitors back-to-back and is said to be one of the very best methods of DC blocking as regards sound quality. So, so far, so good! The output stage does do 'what it says on the tin'! But apparently it could get better because reports suggested that it sounded better when run at between 18-24 volts (but remember that the decoupling cap in the output stage is only rated for up to 25 volts so don't go higher than around 22 volts without replacing that capacitor). So I went back to the workshop and connected up a regulated 22 volt supply to power the I/V stage. I then re-adjusted the voltage across the output capacitors to 11 volts. I kept the existing 12 volt supply for the DAC and sat back to listen again. And it's true! The I/V stage sounds even better at the higher voltage. If you don't already have a suitable power supply for the I/V stage, you could use the 12 volts already going to the DAC section as that will still give a big improvement. Alternatively, a couple of 12 volt batteries and a simple regulator will provide a good source of power for the gain stage. Even if you need to buy or build a PSU, the improvement that the I/V stage brings is well worth the cost (or effort)! Finally, I'm indebted to Ole Schüsseler who suggested another couple of tips to improve Monica2. 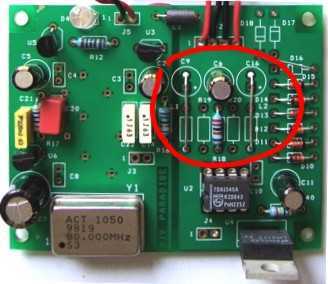 First, drop the supplied voltage for the DAC down to 9-10 volts instead of 12. Apparently that sounds better although I am yet to try it myself. Secondly, buy another two of the Black Gate capacitors used on the output and wire them up in the Super-E configuration. If you like tweaking your Monica2 DAC, you can find a few more tips on this page on the DiyParadise site. So there you are. If you own a Monica2, or any other 1545 based DAC, surf over to the DiyParadise site and get one of the output stage kits while they are still available. You won't believe what your DAC is really capable of!